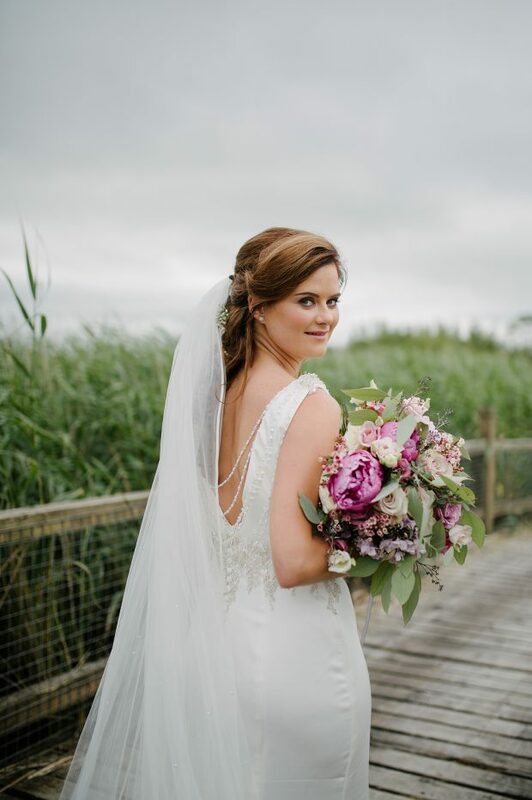 A serene proposal on an Autumn swept beach, set the tone for a perfect wedding day two years later filled with beautiful music and laughter for Rachel McFarland and Tiya Moore – and they even had a little bit of rain for good luck. 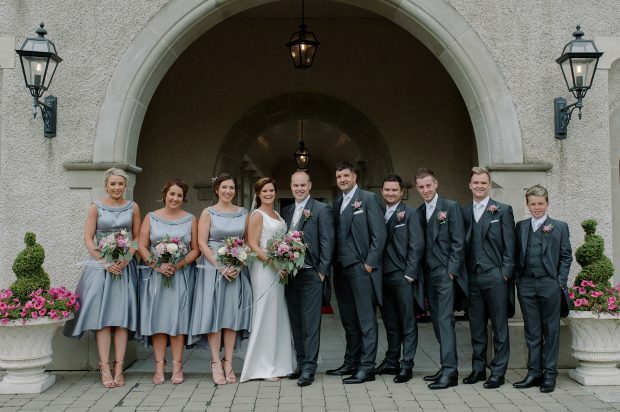 The pair, who are both from Omagh, were wed during a traditional wedding ceremony performed by Reverend Jonathan Cowan at Mountjoy Presbyterian Church on July 20, 2018. 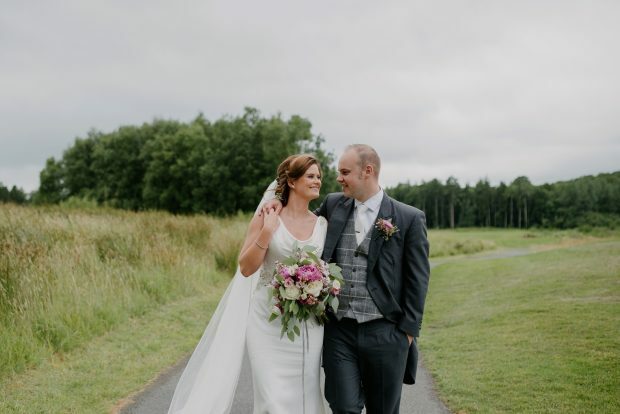 Their wedding reception was held at Lough Erne Resort, Enniskillen – a place which the couple simply ‘loved everything about’. The ambience created by the peaceful setting, the food, friendly staff and gorgeous decor meant that they couldn’t imagine having their wedding anywhere else. Rachel, who is a teacher, explained that she always knew of Tiya as they were neighbours in the park which they lived from a very young age, and both their parents were friendly with each other. However, Rachel moved out of that park aged four and it took 11 years for their paths to cross once more. But when they did meet again, in September 2009, the duo reminisced about fond times gone by and their relationship went from there. Rachel and Tiya used the Lough Erne Resort grounds for their wedding photographs. The pair were together for seven years before Tiya proposed in truly romantic fashion on September 9, 2016 – the day of Rachel’s birthday. “Tiya came to see me and said we would go for a walk on the beach,” Rachel recalled. 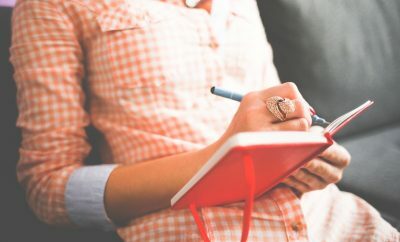 “I should have thought this strange as Tiya hates the beach, however I didn’t pass any remarks as it was a Monday night and the start of the working week, so it didn’t seem like the sort of time to pop the question. “We went for our stroll along the beach and Tiya commented that there was more people on the beach than he thought there would have been,” Rachel added. While Rachel was oblivious to the nervous wreck that was her boyfriend, all of a sudden Tiya said he wanted to give her the other part of his birthday present. Getting down on one knee, the Omagh man gifted Rachel with the ring that she had spotted and fell in love with some time before the engagement. And so from then, just short of two years of wedding planning commenced. 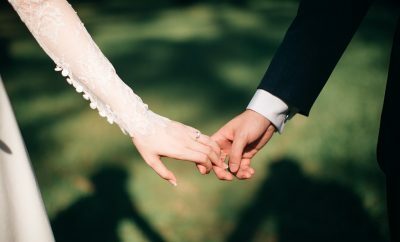 “We were certain that our wedding would take place in the summer months, and as these dates were in high demand, we started our venue hunting right away,” Rachel said. “We had our venue booked by October 2016 and rest of the main providers soon followed. 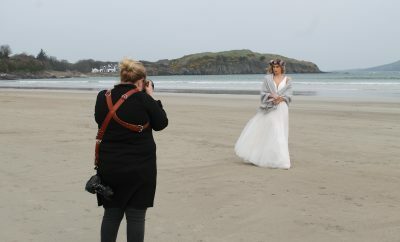 Rachel’s stunning dress with detailed back was purchased in McElhinneys. Her beautiful flowers by Daisy Chain in Omagh. Hoping for a very traditional wedding, the pair wanted the men to wear tails and bridesmaids to don a 1950s style dip-hem dress. 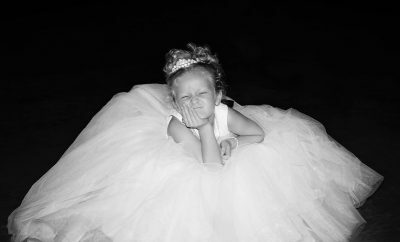 And happily, Rachel knew exactly what wedding gown she wanted so she loved her experience of dress shopping. These cherished moments were shared with her mum, Adele and they visited two different shops which allowed Rachel plenty of time to see and try on all she needed. Rachel said that she found the week leading up to her wedding day very emotional, but she enjoyed having lots of people around at her parent’s house for a catch-up before the hustle and bustle of the big day. “I am a very sentimental person, and all I could think about was leaving home which I really struggled with,” she said. 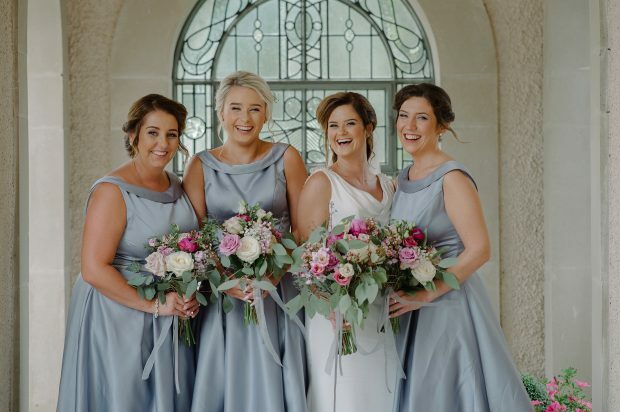 And even though she was worried that she wouldn’t be able to hold her-self together on the morning of her wedding, her maid of honour, Cherith Marshall and two bridesmaids – Lisa Moore and Anna Shaw – helped to keep the house calm and relaxed. In fact, the morning turned out to be a bundle of laughs. “Tiya was very relaxed, as he usually is, but his best man, Garry Monteith, was the complete opposite as he was the most nervous out of everyone,” Rachel recalled. Rachel and the girls arrived at the church in traditional wedding cars, which battled the light, constant drizzle and blustery breezes along the way. But with umbrellas at the ready, Rachel was a perfect picture as she walked down the aisle with her father, Kenneth. Rachel with her bridesmaids Lisa Gilchrist, Anna Shaw and Cherith Marshall. “Tiya was slightly emotional and had to take a few deep breaths to compose himself as I arrived beside him at the front of the church,” Rachel said. 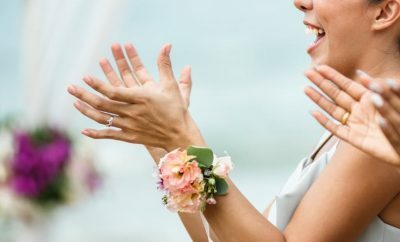 “The hardest bit for me was when my Dad handed over my hand to Tiya as I knew then ‘this is it’.” She added, “Our ceremony had a very happy, relaxed feel and our minister was excellent. He did a great job of keeping everyone calm and having everyone in the right place at the right time. Rachel and Tiya with their wedding party, Anna Shaw, Lisa Gilchrist, Cherith Marshall, Garry Monteith, Gareth McFarland, Corey Moore, Andrew McFarland and Mark Shaw. Hair stylist/salon: Gemma Armstrong, Scizzorhandz, Newtonstewart. Head piece: Parchment & Pearls. Bridesmaid dresses: Creative Ideas, Cookstown. Groom’s/groomsmen’s suits: Bowes Bros, Omagh. Cake supplier: Sandra Marshall (chief Bridesmaid’s mum). Cake decorations: Three-tiered naked cake decorated with summer fruits -strawberries, blueberries, blackberries, raspberries and red currants along with some fresh roses which matched the bouquets. Church: Mountjoy Presbyterian Church, Mountjoy. 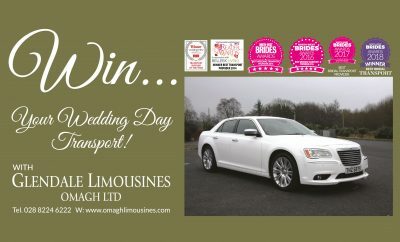 Transport: C4 Wedding Cars, Cookstown. 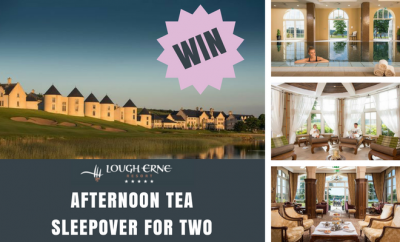 Reception: Lough Erne Resort, Enniskillen. Number of guests at reception: 135. DJ/band: The Untouchables featuring Brian Giffen. First dance song: ‘Close Your Eyes’ by Michael Buble. Other entertainment: Catherine Hamilton, soprano and harpist; singer Zolene Mayberry; Mountjoy Presbyterian Church Praise Band; Saxophone player, The Saxophone Lounge.